ELLIJAY, Ga. – Updates to the project on Victory Circle came in Ellijay’s December Council Meeting. The project, officially named the Victory Christian Center, requested the city take a new road into its maintenance system. The road will connect Victory Circle, behind the old Blue Ridge Carpet Mill, to Progress Road. This new connection will become the main entrance to the facility, and one of three access points, as Victory Christian continues plans to add another entrance on Maddox Drive near the city limits sign, to decrease traffic stress at the four-way stop of Progress Road and Maddox Drive. Following the back side of the old carpet mill, the road will connect from the first curve on Victory Circle. The project, according to Randy Durden from the North Georgia Christian Foundation, will be paid for by combining donations, including property from the neighboring PDQ Manufacturing and Waterwheel and money from the Victory Christian Center for construction of the road pending the council’s agreement to accept the road for maintenance. The official approval came as a motion for agreement in principal that the city would accept the road contingent upon it being built to Georgia Department of Transportation (GDOT) specifications with 60-foot right-of-ways and Ellijay City requirements. However, this was not the only addition to the city’s road systems. The council officially approved accepting 1.6 miles of state Route 382 into the city street system. After consideration in November, the council further investigated and attained confirmation that the state would repave the road. According to Ellijay Mayor Al Hoyle, the Georgia Department of Transportation Commissioner assured him they would resurface the road and make sure everything is in good shape, including striping and guard rails. Along with the accepting of the state road, the council separately approved accepting the Lighting Agreement. The new roundabout being built at the intersection of Highway 382 and Old Highway 5 will have street lights for the roundabout for which the city is agreeing to pay the lighting bill. Lacey was also requested to speak on a second item, a request for speed bumps on Gilmer Street near the senior center. The council asked last month for Lacey to investigate and speak at this meeting. Officially recommending the street return to a one-way street as it has been in the past, Lacey suggested do not enter signs to prevent traffic from traveling toward Delaware Street. The council did not grant the speed bump request for the street, but instead went with Lacey’s recommendation to make it one way. This means traffic on Gilmer Street must flow toward Broad Street and toward the courthouse. Cartecay Vineyards is moving downtown with approval for Cartecay Wine and Craft Pub at 19 South Main Street in Ellijay for a wine tasting room. 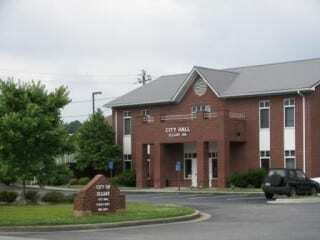 After an executive session, Ellijay’s city council approved three members to the Downtown Development Authority (DDA). With four openings and only three filled, the city is still looking to fill another position on the authority board. Those three approved were Josh Quigley, Mark Luchauer and Joshua Moyer.